The characters and monetisation are Overwatch, everything else is Fortnite, and surprisingly for a cynical cash-in that brazenly takes the two biggest things around at the moment and smashes them together it's not bad at all. Nonetheless, if this really is the only Titanfall 3 we're getting that's a huge disappointment. 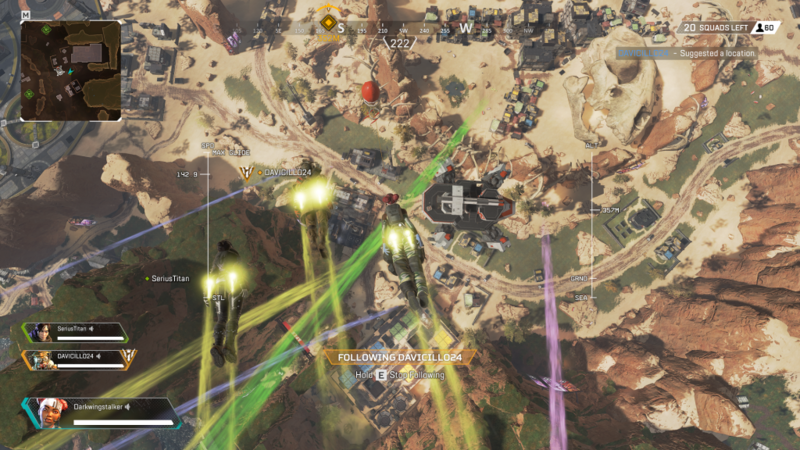 Starting with the positives, dropping in as a squad is super cool (and they realised it too with the music and free-look camera) while also helping to make players stick together as a team, although how well that works out depends entirely on your team-mates. In-fact all the stand-out features of Apex are based on the key change of playing in teams of 3: Pings are a simple system (calling out loot and enemies) absolutely perfected - with character voicelines for pretty much any situation, and (the biggest change by far) a respawn/revive system that lets you come back from dying. It's a change that eliminates much of the waiting around you get in BR games, encourages finishing off the entire squad to prevent a comeback, and adds a whole new type of strategy, but very few team-mates when playing randoms seem to use it, instead running off to try and 1v3 the team that killed you, inevitably dying themselves. I think Apex's changes to the established formula would make it by far the most fun Battle Royale to play with a team of friends but with randoms it's much less of a game-changer. Speaking of Battle Royales, this is one of very few games that stick to the game-show idea of the ORIGINAL Battle Royale (let's not talk about Radical Heights) and that gives an interesting flavour to matches. Big screens and banners everywhere proclaim the current leading player/squad and an announcer lets you know when they've been dethroned. The game-y flavour goes a long way towards explaining the wackier elements that don't fit in a serious setting and lets Respawn focus on map design without having to tie it together in a story-justified way. Because of that each area can be designed as their own, almost stand-alone, miniature arenas, and they're all fun to play in with some interesting visuals to boot. Respawn - known for their game's hugely fluid and fun mobility - have pared down that signature style for Apex significantly, so while the movement is still fun, it's been stripped back to just sliding and ziplining - a huge step down from the options Tf2 gave you. They say it's because grappling, wall-running, double jumping etc was too chaotic for a Battle Royale (and I can completely see that) but it's like being teased by what could've been. I'd like to see them add in maybe one hyper-mobile character who could do those things but even then it wouldn't be the same without the enclosed city spaces (and would probably be an irritating character to fight against to boot). Lack of fall damage does go some way to helping it keep some verticality, with ambushes from above being opened up as a potential option unique to this BR that the map fully embraces. As for the bad, that's mostly the Overwatch inspired parts. Personally I find the characters bland - they've got the "diverse group of people from around the world" thing pinned down but, despite being too cartoonish to really fit in the Tf universe, they still just feel a bit devoid of personality. Even Bloodhound (the one design I do dig) seems to fall apart in other ways with pretty tepid dialogue and less-than-useful abilities. Even the top-tier skins, which should be the things that make you want to throw down some money feel uninspired, with the chances of getting one you do want even lower than in Overwatch due to the sheer amount of stuff they know you don't want that's loaded in: voice-lines, banner poses, banner frames, 15 low-tier recolour skins per character, INDIVIDUAL weapon skins. If you do end up putting money in be prepared to drop a minimum of £8 for each of the two locked characters and £16 for each individual skin. That's 1 and a half Hollow Knights. Even gambling on the lootboxes has an £8 minimum buy-in. Be aware it's also not the most stable game ever made. The very first thing that happened to me was a hard CTD before even choosing a character, and then 3 more happened in-game along with 5 ~1 minute freezes that happened at some decent and some awful times. I'm also getting strange notifications from the game's anti-cheat system whenever I quit that seem to be it detecting the Origin Store itself as a cheat. Whether that'll cause problems eventually I don't know but, other than those issues and some entertaining animation bugs, it ran fine for the 7-ish hours I played. I was very impressed with the dynamic resolution that works just as brilliantly as it did in Tf2. Positional sound seems to be borked because all I'm hearing is left/right/both channels which is absolutely useless in a Battle Royale where you're trying to track gunshots and footsteps - try turning your character as the tutorial bots are speaking for an extreme example of this. If they fixed the frustrating crashes I'd recommend the game, but only if you planned on playing with friends or on mic. There's a special feeling of betrayal you only get with this game where you see one of your team-mates fly off on their own (or just vanish as their game crashes) and know that you've already lost the match before it's even really started.